For widespread use, everyone who wants to use videoconferencing needs to be able to get access whenever they need it, wherever they are, just as they do today with personal communication devices for voice. And they need videoconferencing to meet the high quality threshold set by telepresence. The challenge is that telepresence rooms are very expensive to acquire and operate, so access is limited if available at all. The opportunity for IT is to adopt an architecture that removes the requirement of expensive high QoS networks for video, while also enabling the ten-fold growth in endpoints. This will deliver access to videoconferencing for teleworkers and road warriors, as well as those who work in the office. The new architecture should require only a best effort, low cost network to make this option affordable in the face of much greater demand for bandwidth. It is not economically viable to support the massive increase in multipoint videoconferences via the Multipoint Conferencing Unit (MCU) architecture. Legacy videoconferencing solution providers use costly hardware to transcode video from different sources into a form that can be used by each endpoint. Rather than benefiting from Moore’s Law the way the PC industry does, the legacy videoconferencing solution providers require increasing costs for increasing quality without the benefit of economies of scale. Beyond the sheer expense, the fundamental flaw of the decades-old architecture of a multipoint room-based deployment architecture from legacy videoconferencing solution providers is that it fails to deliver the telepresence experience required for large scale adoption. So if the architecture of the past will not support the deployment model of the future, what can you do to prepare your network for the growing demand for desktop videoconferencing? The answer is in a new videoconferencing architecture built upon the newest video compression standard—H.264 SVC—enabling the removal of the high QoS network requirement while maintaining the low latency, high resolution per user face quality threshold required for mass adoption. The VidyoRouter™ architecture is designed to connect large numbers of videoconferencing endpoints over best efforts networks—including the Internet. The VidyoRouter architecture eliminates transcoding and routes packets individually to each endpoint as required, providing the best experience for every user. The result is an IT infrastructure that optimizes bandwidth use, minimizes capital investment and lowers operating costs. 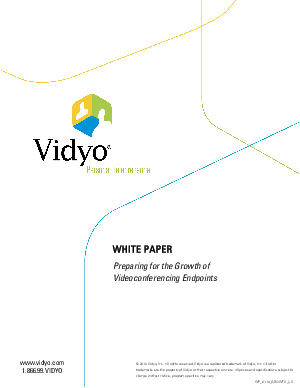 Gartner predicts tremendous growth in videoconferencing. Existing SD quality room system deployments will be replaced by telepresence and HD quality rooms, but overall the room system number will remain relatively flat. Gartner further predicts the explosive growth will be in desktop endpoints. For this adoption to take place, the desktop deployment must also deliver the high quality experience expected by users. VidyoConferencing delivers at least SD quality per face with the required natural interaction, across the full range of endpoints. And with today’s PCs and broadband networks it is possible to deliver Telepresence quality to the desktop—Personal Telepresence.